People only remember about 10% of information they hear three days later; but if you add a picture, that number jumps to 65%. 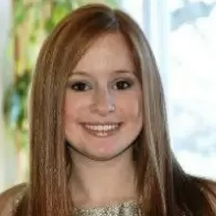 Pictures can capture people’s attention, trigger an emotional response, and encourage action. Because of that, companies looking to build their employer brand can use visual storytelling to stand out from the crowd. Philips’ gobal approach is to get in front of candidates in an “unexpected way,” says Dominique Mallion, Recruitment Marketing Manager EMEA, which is why she was so excited to try carousel ads to improve their diversity and inclusion efforts. 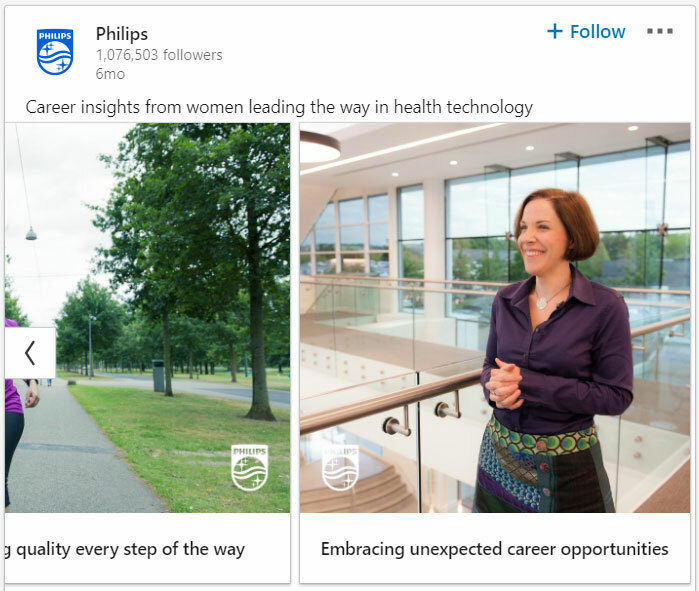 Philips needed to raise awareness among women about senior leadership roles at the company. So they used imagery to highlight career perspectives from senior women at their company. Dominique recognized that people are used to consuming stories through scrolling imagery or “cards” and wanted to apply that same marketing tactic from an employer brand standpoint. They were able to repurpose creative assets from previous campaigns to make launching this campaign faster, and easier, and bring additional visibility to this content. The results were outstanding. The campaign outperformed all others for the same audience with an engagement rate 30% higher than their target at 1.4%. 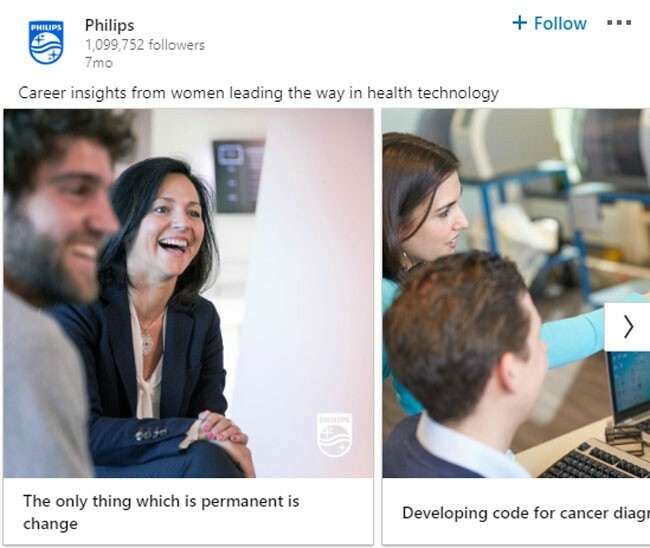 Offering up an authentic view into leadership at Philips and letting employee voices shine made this campaign ring true for their target audience and fostered a connection to the company. 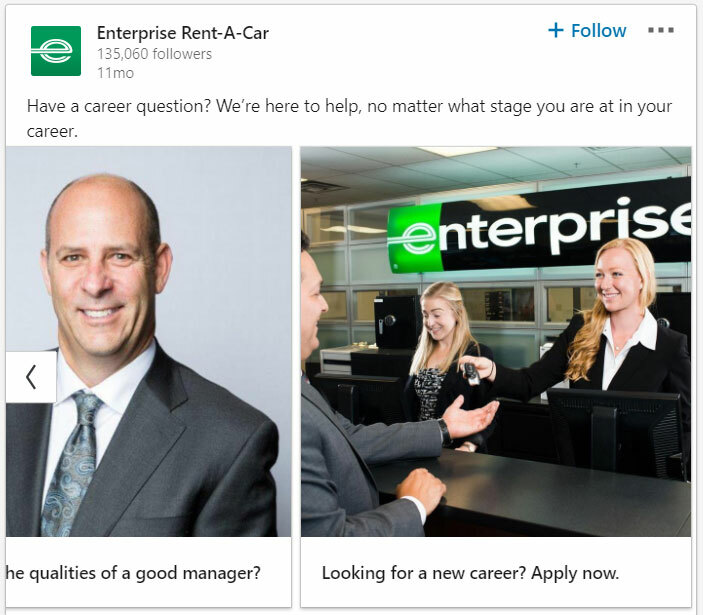 Enterprise needed to reach their digital audience with a longer brand story about how their company could help candidates grow their careers. Employer Brand Manager Carmen Mason wanted to create a compelling story arc to get audiences interested in the Enterprise Management Training Program and knew that carousel ads could be the right vehicle for that story. Typically, college grads looking for an entry level position are hired into that program, but Enterprise also wanted to attract career-changers. That meant they would need to nurture the audience over time in order for them to consider making a move to Enterprise. Carmen and her team developed a story about thinking through your next career move – providing thoughtful, informative content to help their audience, no matter their career stage. They used existing creative assets and tied them together in a very intentional way, with the first card featuring a “carpool-karaoke style” interview video that had already proven successful for them as a LinkedIn Sponsored Update. The following cards built on the story, continuing to add professional development advice, until the audience was finally directed to “apply now” and visit their job search page. 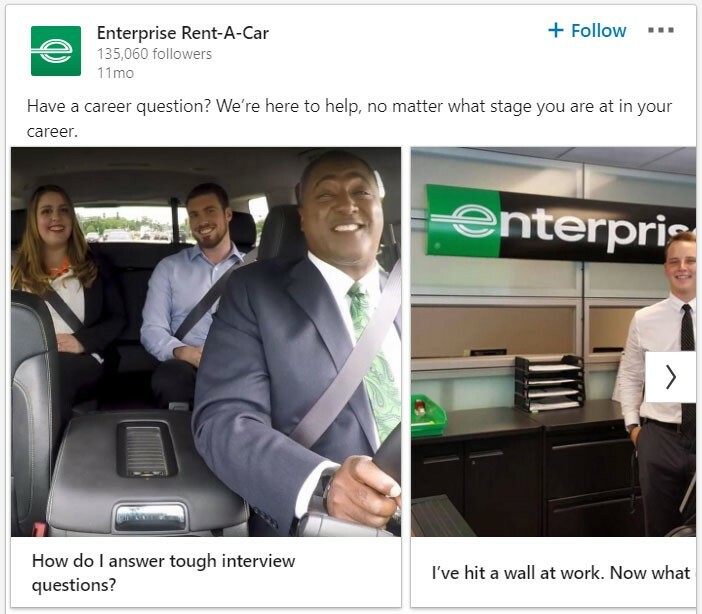 Enterprise's goal was to drive awareness and tell their story in an engaging way that would inspire the audience to think about Enterprise as a strong career move. Even with their initial test, results were very positive. Their overall click-through rate was 2.1%—almost double the average for employer brand carousel ad campaigns on LinkedIn. 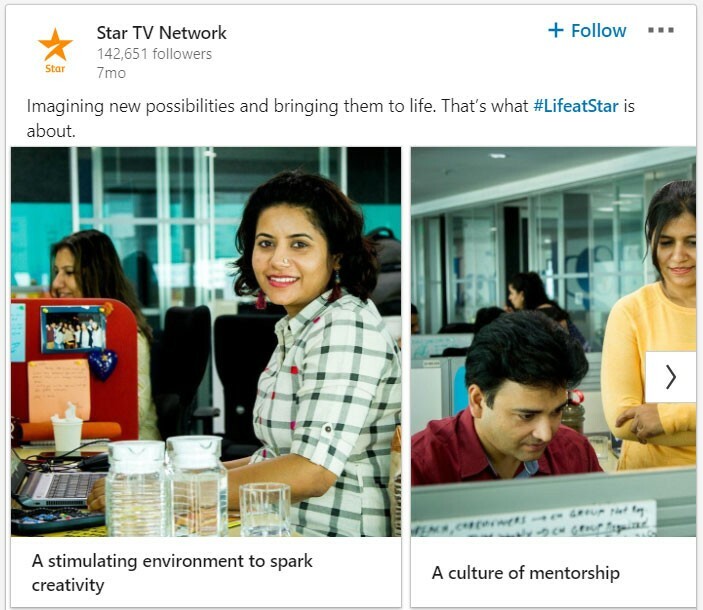 Star TV Network of India wanted to connect with candidates by highlighting their diverse and talented employees who help shape their company culture. Ritika Ranjan, a member of the Brand & Marketing Strategy team, was interested in showing off their culture of mentorship and wellness as well as career opportunities, all while highlighting their passionate people. 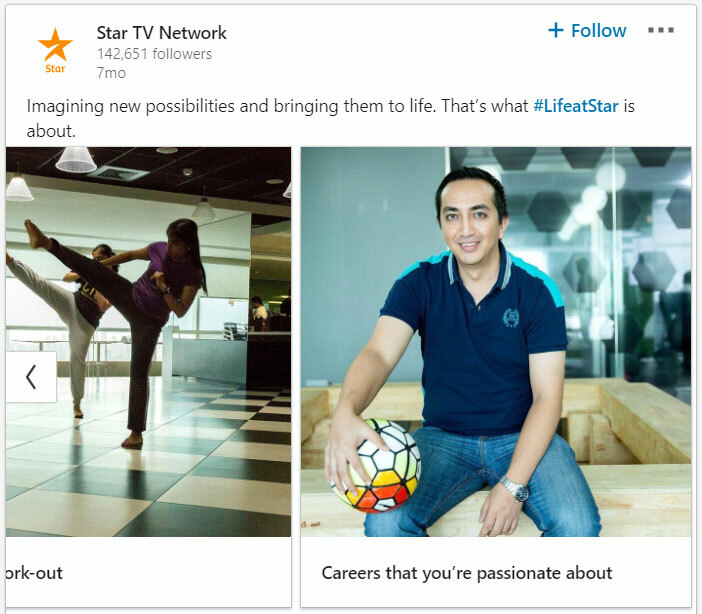 So they devised a campaign that was targeted to the job functions that Star needed to hire. Whether you’re showcasing thought leadership, career advice, or your awesome office space, carousel ads help you bring your employer brand story to life in a way that is not only visually compelling, but also familiar to audiences. Not only that, but sometimes the most successful campaigns are built by repurposed content, which makes carousel ads a quick win.